RIO DE JANEIRO, July 13 (Xinhua/Sun) -- Joachim Loew says Germany's 1-0 victory over Argentina in the World Cup final is the fruit of a decade of investment in the country's youth development. At his post-match press conference, Loew hailed programs adopted by Bundesliga clubs after Germany's failure to progress beyond the group stage at Euro 2004. "In 2004 German football was down but we took some decisive steps," Loew said. "We decided we had to invest more in education. We needed to produce players who were technically better. Having German virtues wasn't enough because other teams had them too. We had to be better on the pitch. "We have created centers of excellence which have brought results. I'm grateful for the clubs that have done that. This (World Cup triumph) is a product of the excellent training young players get." Loew said his team had benefited from the influence of coaches like Carlo Ancelotti, Jupp Heynckes and Pep Guardiola at their respective clubs. When asked if Germany's quick-passing style was inspired by Spain's celebrated tiki-taka, Loew replied: "I don't really know. For the last few years we have been developing our own style. "Playing at successful clubs has helped them to be self-assured. I believe this title will push the country even more. We have lots of good players who are very young. "Mario Goetze, Marco Reus, Sami Khedira, Andre Schurrle and Toni Kroos are all young players who will be around for many years to come." 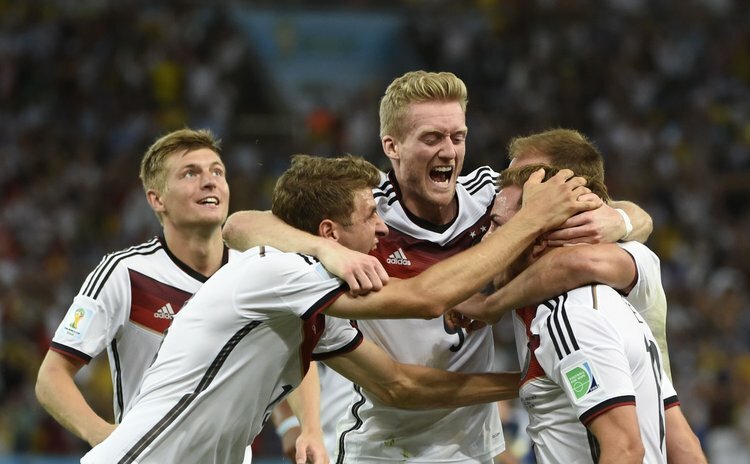 Germany's victory sees them equal Italy as four-time winners of football's most prized trophy. Only Brazil with five have won more. It was Germany's first World Cup triumph since 1990, when Franz Beckenbauer's team also defeated Argentina at Rome's Stadio Olimpico. Loew said his team had shown they were the strongest throughout the tournament. "There can only be one winner and we deserve it," he said. "I believe we were the best team for seven matches. But it's not just today. It's 10 years of preparation.